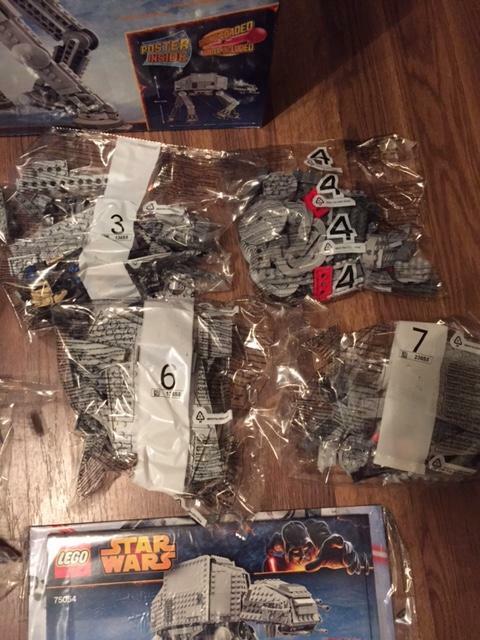 The LEGO pieces in the bags look legit, but wondered why the bags are different. The box appeared to have been opened when I received. Just want to make sure the bags are official LEGO before I try to sell. The bags have "LEGO Group" written on them, so that's positive. First of all, congratulations on securing a 75054 AT-AT. This is a very desirable set, and costs a pretty penny to purchase now that LEGO has stopped producing the set. There is nothing wrong with your bags. The bags with the white band are of a newer design than the bag labeled "4". The white-band style was introduced in 2015, whereas the older style was used as of 2011. LEGO is slowly phasing out the older style in favor of the white-band style, working through remaining supplies of the latter until they run out. Not the answer you're looking for? Browse other questions tagged packaging or ask your own question. Why do LEGO boxes have a maximum age limit? What does the 4 digit number embossed on my LEGO set represent? When did LEGO stop using perforated plastic bags and switched to simple ones?